After the previous evening’s appalling discovery of my failure to properly plan the opening destination of our tour, we were left with a more relaxing start to the day, having been relieved of the urgency of delivering the car to the garage and getting to the ferry terminal for an early departure. Instead, we sorted out our luggage, discarding the cycling clothes brought in case the weather was particularly cold, and took the car to the garage, Hazelbank Motors, where the car was to be left during our trip (we’d used their storage on a previous trip from Oban). 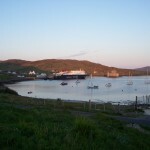 From there, we rode down to the CalMac terminal to buy ferry tickets. We bought two of the Island Hopscotch tickets (#8 including Oban-Castlebay; Barra-Eriskay; Berneray-Harris; Stornoway-Ullapool). Boarding wasn’t until 3pm, so we set off south from Oban on a little jaunt to the island of Seil, connected to the mainland by the impressively named Atlantic Bridge. Leaving Oban involved cycling up a pretty steep hill which, even in the morning sunshine, had us sprinkling copious sweat. Well, actually, my lady stoker (being a lady) merely glowed. 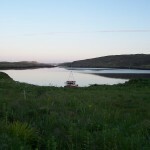 Once over the top, it was a speedy descent to Loch Feochan and a pleasant ride alongside the water. 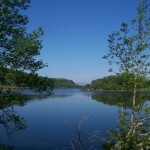 Near the mouth of the sea loch, we turned off towards Seil, along a rather nice ‘B’ road. This was quite challenging at times, featuring a 15% gradient at one point. 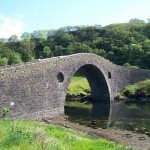 We entered Seil by crossing the Atlantic Bridge, which was built in 1792. This turned out to be a delightful (but very steep) stone bridge spanning a few metres of the Atlantic. 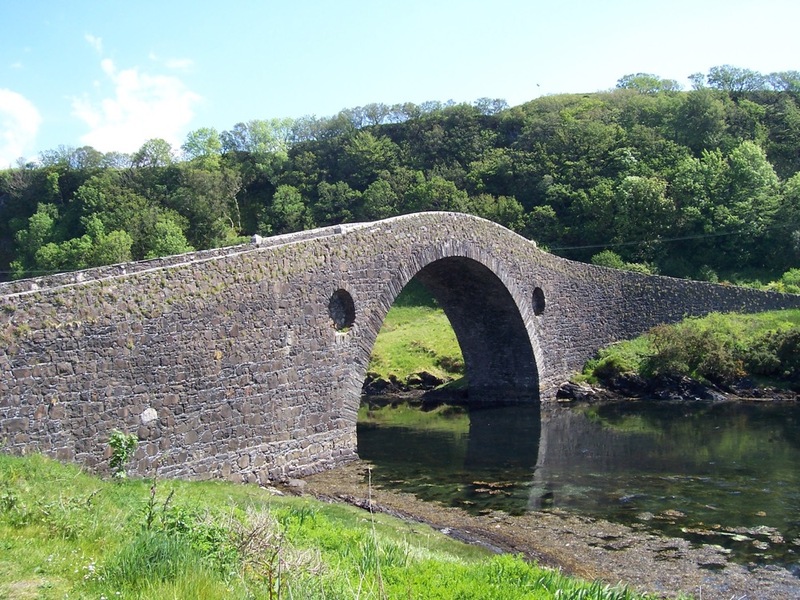 It’s also known as Clachan Bridge, and almost unbelievably, whales have been known to become stranded under it! I’m not sure if there were objects originally in those circular niches either side of the span. A few miles further on saw our first Magnum ice cream stop at a small shop, after which we headed back to Oban. At the CalMac terminal, we chatted with a bloke touring on a Brompton. He recommended the nearby seafood stall, where excellent crab and smoked salmon sandwiches were to be had. We bought one of each to eat on the ferry. There was a queue of over dozen bikes, including another tandem. The ferry was really quite empty, and the trip uneventful (except for the drama of a passenger who took a nasty fall, requiring the assistance of a couple of nurses). Indeed, the sea was particularly smooth, and the skies astonishingly sunny. It was even warm out on deck. Time passed quite quickly, lubricated as it was by sampling a pint each of Clansman and Islander beers from the Hebridean brewery. 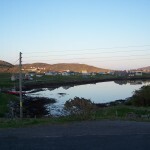 We eventually arrived at Castlebay, and disembarked as a gang of about 20 bikes (so my original estimate must have been supplemented by late arrivals). Many of the cyclists seems to be headed for a hostel close to the ferry, but some others pedalled off into the distance. We made for the Ravenscroft B&B, where we’d stayed a couple of nights a few years ago. It’s a delightful B&B, very friendly and comfortable. Castlebay was looking lovely as it was lit by the low sun, and we went for a brief walk, taking a few snaps along the way. 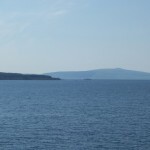 You can just see Kisimul Castle from the bedroom window, though it’s rather dwarfed by the ferry we’d arrived on! 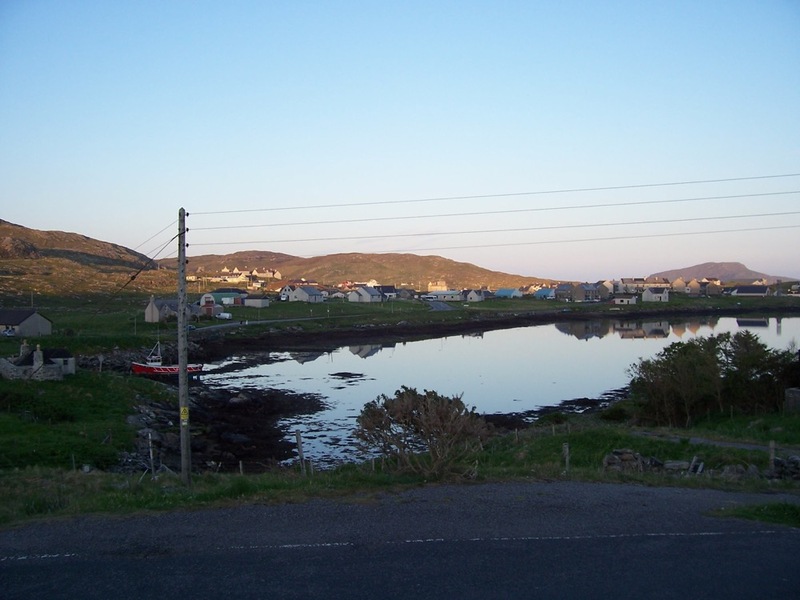 The following day’s plan was to head for Lochmaddy, a longer day in the saddle than originally planned, and expected to be around 56 miles. Today we did around 32 miles all told. Nature points – geese, herons, hoodie crows, cuckoos (heard not seen, on Seil and on Barra), corncrake (heard and not seen on Barra). 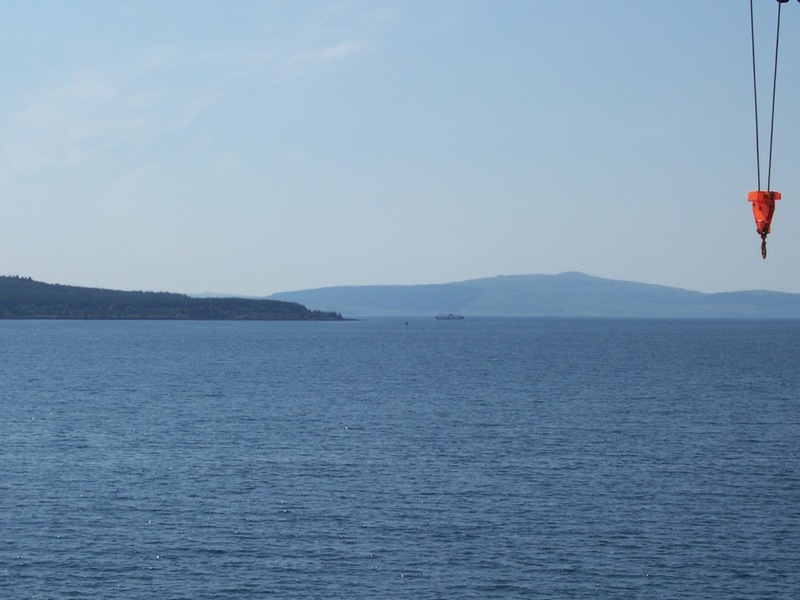 As we passed through the Sound of Mull, sight of the Fishnish to the Lochaline ferry suggested an alternative route from Strontian, which would avoid returning to Oban by the A85 trunk road. 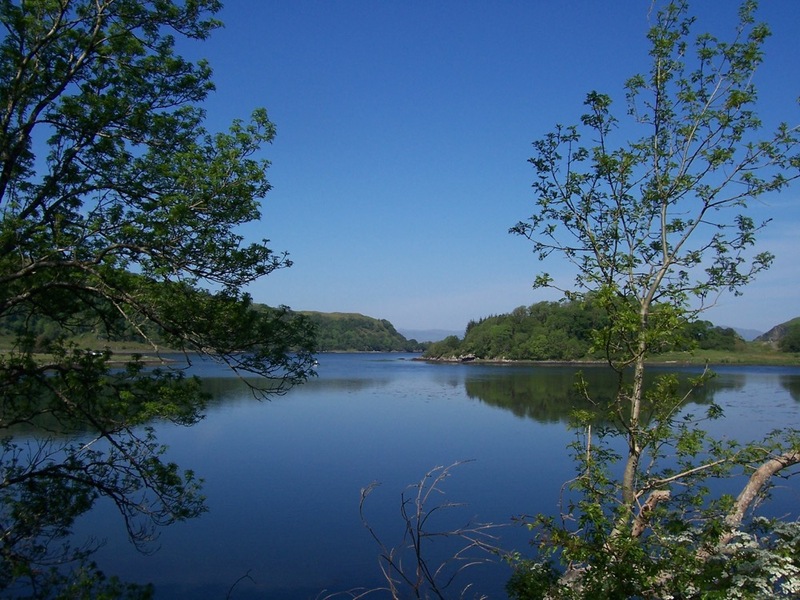 From Strontian, we’d cross Morvern to Lochaline, cross to Fishnish, then cycle to Craignure to catch the ferry back to Oban.